Snowflake!! Thanks to my awesome swap partner BeckyB, I have the hooks and thread to make an army of snowflakes and doilies!! Probably will be making more snowflakes but I'm curious about doilies. I haven't starched it yet, gotta figure that one out yet:think. 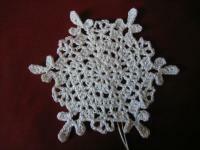 So here it is, my first Snowflake with Thread!!! Can you see the sparkles? Probably not, its not the greatest picture but they're there. Trust me. Great job!! Glad your having fun!! Having a blast! I'm making a snowflake garland now, I'm 6 snowflakes in! 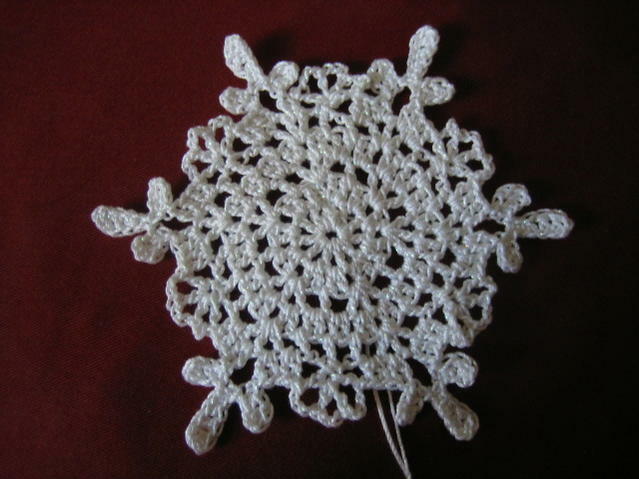 Congrats on finishing your first thread snowflake! It turned out beautiful! I hope you will have many more to share! Great job! It turned out beautifully! You know it's pretty - but now I'd love to see your snowflake army! Beautiful! Great job on keeping the tension steady. I seem to struggle with that when making snowflakes.